If you feel you are healthy and perfectly fine, it is great. But getting it confirmed from your doctor or physician is important. You can do it only with regular visits to your doctor and few health checks that confirm you are free from the risks of the diseases that may affect your body nearly or lately. Chennai is counted among the fastest growing cities of India. Chennai as a city is pretty famous for the low-cost health care service provided for foreign and domestic tourists. But as time elapses, the city is expanding slowing counting many rural regions under it’s name. This has also given rise to a number of people residing in slums. The city has also seen a tremendous rise in vector-borne diseases after the city is been facing problems with incessant rains. The population is also facing the same burden of NCDs as the rest of the nation. People of the underdeveloped areas of the city have a continuous complaint about a shortage of healthcare facilities that are accessible to them. “Infrastructure in government and private centers has not kept pace with the growth of the area” is what people say. Residents say there are no proper healthcare facilities near them that have forced them to travel long distances to get to not just hospitals but also access pharmacies. People need to travel for quality healthcare services to the main city only. There are a few primary healthcare facilities available in these areas, but they hardly function for few hours and emergency and trauma care is even far away from thoughts. The best part still remains. Chennai has a mix of government-aided and private hospitals catering to the needs of the people. The city is popularly known as the Health capital of India. Multi and super-specialty hospitals across the city treat approximately 150 international patients every day. Factors like low costs, little to no waiting period, and quality facilities offered at the specialty hospitals bring the huge inflow of the outside patients to the city. There is tremendous growth in the healthcare industry and the technological advances in a diagnostic industry are on the boom. A healthcare service often relies on complex technologies directed to serve medical and public health reasons. The development and adoption of these technologies are costly which has directly increased the health care costs. All this makes healthcare an expensive event and not all in places like Chennai can afford it. Access to health technology is one of the most distinct differences between the rich and the poor. It is said that people who pay for their health care services suffer catastrophic costs. While millions suffer and die in absence of access or inability to afford medical care, many others suffer because they end up paying through debts, selling assets and ultimately ignoring their health problems. As education is getting better, people are becoming familiar to better standards. They now demand for latest treatments, timely, affordable care, and a range of choices. People are now better informed than ever about their health and their treatment options. They are ok to take some responsibility for their own health, but at the same time they do not want to pay a lot more than they already are for their health care needs. Best quality at the lowest prices is what they expect. With this large number of people, Chennai is the fourth largest city in India. It is estimated that 8.7% of the population is poor and under poverty line and the physical and emotional development of children growing up in these circumstances suffers. Families often rely on children to contribute to the family income in Chennai. Since the city is a major trade and tourist hub, most of the young and the adult population of Chennai is involved in work and is slipping into sedentary lifestyle along with consumption of deep-fried food, canned food and alcohol, chewing of tobacco and problems like human trafficking have increased the risk of disease instance in the city. Chennai shows the highest incidence of Brest cancer followed by lung, stomach, male and female reproductive organs above the age of 45. The age population of the city seeks old age home for their living and most of the population is far away from the reach for healthcare services. Do all of them need a full body check-up? Around 60% of deaths in India occur due to chronic diseases. Chennai also faces the burden of chronic diseases such as heart diseases, diabetes, chronic kidney and liver diseases, cancer, arthritis and many more. As many as 100,000 lives could be saved each year simply by increasing the use of common preventive care health check-ups. The most common chronic conditions people face in the early ages of 30s id diabetes and high blood pressure these days. 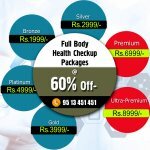 Regular Full Body health check-ups includes basic tests like general physical examination for vitals, complete blood count or hemogram test, Lipid Profile for cholesterol levels, Diabetic profile tests, Liver Function tests, Kidney functions test, chest X-ray and ECG for diagnosing heart problems with few other cardiac risk markers, Ultrasound of the abdomen and pelvis along with an Urine analysis. Proper disease management can prevent unnecessary hospitalization and reduce the cost of primary care. Earlier the detection and diagnosis of the diseases, earlier they can be treated. It also makes it easier for the doctors to choose a way to diagnose any health issue at early stages. A regular visit to the doctors can build a better relationship which works wonders during health crisis. During the need of the hour you already have a doctor, with your medical records handy which will help the doctor take decisions quickly as he already knows what your body needs. A regular full body check-up is very important for people of the medieval age like 30 to 45 as they are the target for most of the stress related diseases. The fast moving life and hectic work schedules can give rise to many health ailments that are highly influenced by the stress levels like hypertension and high blood pressure, weight problems, mental disorders, diabetes, Alzheimer’s disease, depression, asthma, and gastrointestinal problems. As a person catches age, small ailments start turning into long term illnesses. Conditions that are incorporated into the bloodstream, including cholesterol, diabetes, cancer, high blood pressure, anemia, coronary artery diseases and diseases pertaining to liver, kidney and thyroid start showing up. So it becomes even more necessary to visit your doctor regularly for master health checks after the age of 60. According to a report by UNICEF, around 1.2 million children died of preventable diseases in India in recent years. Premature neonatal birth complications, pneumonia, diarrhoea and sepsis remain the top killers. Apart from these early year diseases, the urban schooling children in Chennai also face the problem of obesity, diabetes and high blood lipids. The risk factors that affect these young children includes hypertension, smoking, physical inactivity, obesity and improper diet. Chennai recently has beaten Delhi for the ranges of Air pollution, due to which a large number of children along with the adults are facing lower respiratory infections. All these diseases can be prevented with good sanitation, clean drinking water facilities at home and schools, clean toilet facilities, proper nutrition and educated eating habits can definitely help children from being targeted by most of the infectious and viral diseases. Immunization at the right time and of course a complete immunization will protect the children from dangerous diseases like Hepatitis, pneumonia and typhoid. Children are our country’s future. We can’t let them suffer before they start turning this world into a better place. Chennai attracts around 45% of the world’s population for meeting their healthcare needs. This is because; foreigner’s can afford the cost of healthcare in India. But as a domestic healthcare need, many of us cannot afford it. India as whole faces hurdles like lack of professional experts, non-effective reporting system, and low budget allocation in developing a better healthcare system. The underdeveloped areas of Chennai also face problems in accessibility and affordability of healthcare services. Most of the people are not covered by any kind of insurance and bare their healthcare expenses out-of-the-pocket. The only way to treat your diseases and keep yourself healthy is by preventing them. Here is an answer for how you can prevent deadly diseases taking over your healthy lives. A regular full body check-up. There are many such check-ups offered by various hospitals, diagnostic centers and NGO’s in Chennai. You just need to find one and follow it. 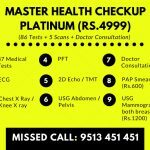 There are a range of online guides that help you with the information about health check-ups in Chennai. One such online guide is Bookmyscans. We are designed in a way that we are easily accessible to all and provide health check-up packages at different approved and certified centers at affordable prices. The cost of different health check-ups depend upon the type of package you choose and the number of tests included in that package. A basic health check-up includes common tests like complete hemogram, diabetes profile, lipid profile, kidney and liver function tests and urine analysis. The basic package costs around INR 1999 in Chennai. But this basic set is not enough for everyone. You need to get yourselves checked according to the age, symptoms and risk factors. Different age groups need different set of tests, and we understand the need of this. 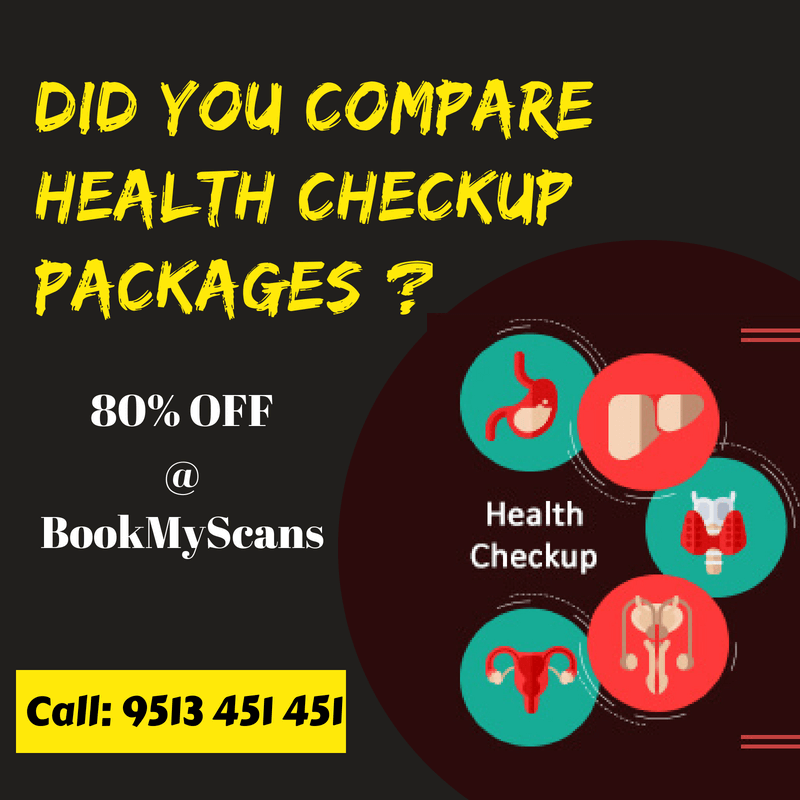 We at Bookmyscans provide you with packages like Preventive Health check-ups, Wellness health checks, master whole body health check-ups and specific diseases/ailment health check all at 80% discount. You can compare the price list and then choose the center as per your requirement. We assure you the best quality reports at the lowest price. We partner only with centers approved by AERB and certified by ISO and NABL. We periodically audit are partners to make sure to deliver technically compliant and accurate results. We offer home collection of samples too so that our elderly clients need not take the trouble of visiting the centers. The reports are accessible online and can be downloaded anytime. These regular check-ups not only help you diagnose diseases early, they also help you save on unnecessary health cost you may occur if you ignore your health. It also reduces the treatment costs at a greater extent. Investing a little today can build a healthy tomorrow.